While the New York Jets‘ season didn’t pan out as they would have liked, there were plenty of positives. Rookie quarterback Sam Darnold showed flashes of brilliance that will likely come in an even higher quantity in 2019. Safety Jamal Adams ball-hawked his way to becoming PFF’s fourth-highest graded safety (89.7). But maybe most importantly, members of the Jets’ defensive line stepped up to form a vaunted front. A year ago, the Jets relied heavily on the services of Leonard Williams and Steve McLendon, who both graded above 75.0, and Muhammad Wilkerson. However, with the Wilkerson’s departure after his average (by his standards) 2017 season, the Jets needed a third and fourth big man to step up and fill the void. They got just that with the emergence of Mike Pennel and Henry Anderson. Pennel was already entering his fifth year in the NFL in 2018, but the former undrafted free agent had yet to break out, as he hadn’t posted a grade higher than 75.0 in his previous four years. Then, in his second season with the Jets, the interior defensive lineman excelled in run-stuffing and pass-rushing. His 19 run stops were a career-high, and he made first contact on 23 running plays, which matched his career-high. 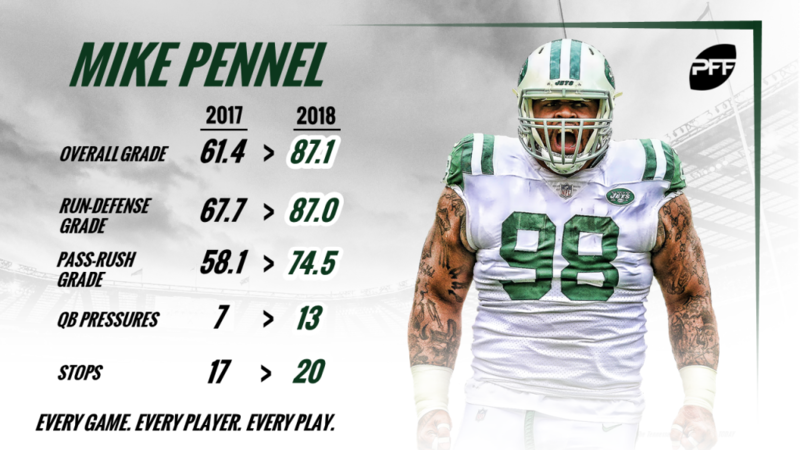 As a result, Pennel graded out above 85.0 in six games on the year. Before 2018, he had just four such games in his entire career. Three of those games were against the New England Patriots, Denver Broncos and Chicago Bears, which rank third, seventh and 13th, respectively, in run-blocking. He finished the year with an impressive 87.1 overall grade, tied for 17th among interior defensive linemen and far and away the best grade of his career. And alongside Pennel, Anderson found his footing as a pass-rusher. After spending three years in Indianapolis, Anderson joined the Jets as a seemingly well-rounded player still looking to make a big splash as a pro. He was coming off a respectable 73.9 grade with 18 pressures and 11 run stops in nine games. For the Jets, Anderson certainly made that leap. He exploded for 48 quarterback pressures, including eight sacks, after having 55 pressures combined and just three sacks in his prior three seasons. He earned career-bests in overall grade (76.5) and run-defense grade (78.0) after logging nearly 300 more snaps than he did in his shortened 2017 campaign. The Jets were one of four teams with a defensive interior that had four players with 15-plus run stops — the second-straight year in which they’ve done so — and have shown promise with a relatively young defensive front that has three key members of age 27 or younger.